If you are planning a long road trip it is essential to plan ahead for anything that may come your way. Here are 19 must have items for your next road trip! Sometimes the best way to learn what you need on a road trip is learning from a bad experience of what you desperately wish you had in a sticky situation. If you are traveling with kids this list is even more essential. We take an annual road trip with the kids every year, but we also regularly make trips to places that are 1-2 hrs away. These items are things we try to always have on hand because you just never know when you will be in a bind. Pack snacks for the kids. Snacks and naps keep kids happy. We like to set up shop with a cooler packed full of snacks that will sustain us through the trip. One thing I like to do with the kids is go shopping together and let them pick out their very own snack for the road. I like to go ahead of time so that when we are stopping for gas they aren’t asking every single time we have to make a stop. It also gets them excited about starting the road trip and having a special snack all to themselves. **This saves money too as grocery store prices are almost always cheaper than what you would spend at a gas station. It is a good idea to have dry snacks like crackers, pretzels, and chips so that it doesn’t have to be kept cold to taste good and take on the go. I try to keep these type of snacks in my car through the year, even more so in the summer when we are out on the go more. Pack snacks for you. There are a few sweet treats that I love to have on a road trip, but I will always pack something that is sustaining and delicious. 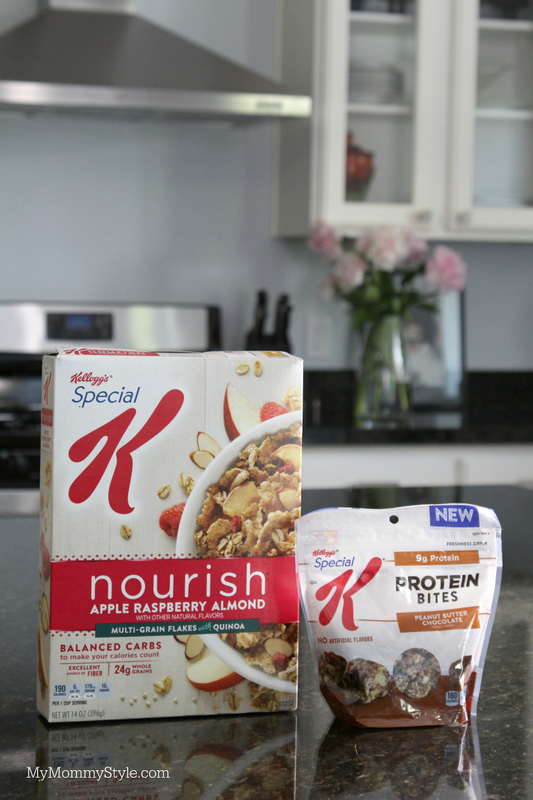 Special K‘s new line of Nourish and Protein items are some of my favorite. The Protein bites are delicious and perfect for on the go as they have a resealable top and will not make a big melty mess in the car. They are also packed with 9g of protein! 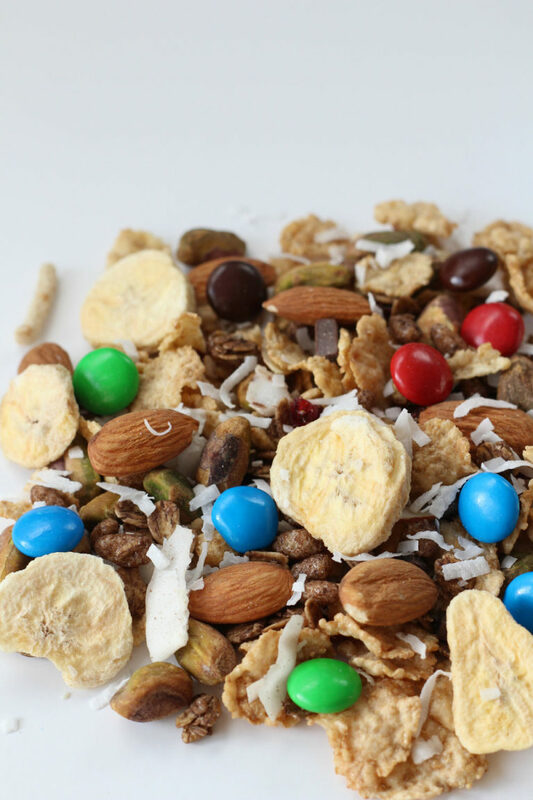 You could also try this trail mix I made using Special K Nourish cereal that is the bees knees. Omit raisins and welcome in the craisins. The Protein bars are also amazing and packed with ingredients that you know and can see. I love the Chocolate Peanut Pecan. SO DELICIOUS! If you can manage it, remember to bring plenty of fluids to keep you hydrated and feeling good. Gas stations stops are good too. Wipes. Wipes are miracle workers. They can be used in sticky situations from spills to blow outs. I always have way more than necessary. If they dry out simply add more water and you are good to go. Umbrella. We always have one in the car. You just never know when you are going to need one. Car safety/repair kit. We love ours that includes a safety blanket, jumper cables, a first aid kit, tools and more. It is a good idea to check fluids and have a safety check up before a long road trip. Individual entertainment. If you can manage it, it is so nice to have a tablet for each kid in the car. Have it fully charged and loaded with games, movies, and apps that your child loves. Kids these days are so spoiled!! Man, we had to listen to an audio book or intermittent music on our long family trips back in the day. Just this last year we bought a tablet for each of the kids and it has made road trips so much easier. Chapstick. With all the extra air flow in the car, you may find your lips feeling dry. I love having chapstick and gum in the car to help my mouth feel fresh. Extra clothes/diapers. On our most recent road trip we were making good time and only realized after hours that we hadn’t changed our son’s diaper in a while. Whoops. I was so glad we had extra clothes and diapers to help him feel comfortable and fresh again. Audio books. My husband and I love to find a book that we both find interesting and listen to it in the car. If you have small children in the car you could consider getting a child friendly mystery that would be fun to talk about at stops along the way. Create your own theory as you go. Sunflower seeds. My husband is obsessed with sunflower seeds for car trips. They are his #1 must have. They help him stay awake because his mouth is busy doing something and he loves eating them. I can tell you they are much more fun to eat than they are listening to someone eating them. 🙂 (I joined him on this last road trip and the process was a lot more enjoyable.) We love the BBQ flavor. Caffeinated drinks. This is for obvious reasons. Make sure to pull over if you are ever feeling too drowsy to drive. Sunglasses. Keep your eyes safe! Headphones. This has helped many times when our kids want to listen to their own show/game or we need to add some distance between them. Re-usable water bottle. I love to bring my favorite water bottle along for the ride. It reduces waste and helps me drink more water through the trip. Sunscreen/bugspray. I always keep a bottle of each in my car. I prefer a stick of sunscreen for the kids’ faces because it fits in my purse easily and it is so much easier to put on their little faces. Car sick kit. This is a really good idea if you are traveling for long periods of time and/or have children who get motion sick more easily. Include a small towel, antibacterial wipes, a small bucket, and a granola bar. Cool air always helps me if I am feeling sick. Have them keep their eyes on the car’s license plate in front of you, eat a snack, and breathe in cold air from the AC. Pillow/special blanket. Our kids love to travel with their pillow, small blanket, and special friend. We limit it to one special friend so we don’t have a stuffed animal zoo. Kids seem to travel so much more comfortably when they have a comfort item to enjoy the journey with. Garbage bags/car garbage. Recently I started using a small box as a garbage can for the front of our car and we have loved it for our road trips this summer! I think it is time that we invest in a real garbage can, but for now it does the trick and keeps the clutter down. Car Chargers. My husband and I have a lot of tech to keep charged between our two phones and the kids tablet chargers. We love having a car adapter and an audio cable to we can play music in the car and keep our gadgets charged. Proof of insurance/ID. This seems super obvious, but it is a good idea to check to see if you have physical proof of insurance in your car or a screen shot of it on your phone. What items can you not travel without?